Who says you HAVE to wear regular work boots on the job? Try these instead. A layered comfort insole. A durable abrasion-resistant outsole. And Steel Toe protection. Get the Western style you love…one that stands up to the rigors of your demanding workday. 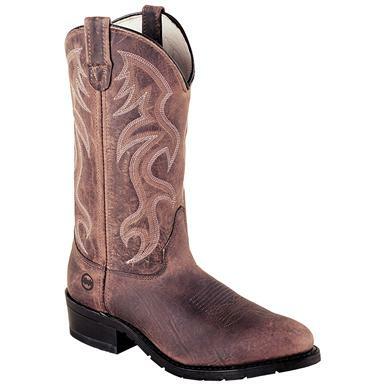 Order these Steel Toe Western Work Boots right here! Double-H Mens Steel Toe Western Work Boots is rated 5.0 out of 5 by 2. Rated 5 out of 5 by Michael from Good wide boot They look and wear well, steel toe is needed in the workplace as a requirement. They get lots of attention, as you are the man in boots, They have a good insole and are comfortable all day. Mine held up for 3 years of heavy work and wear as I took care of them by cleaning them up, polishing and mink oil when needed. Usually go through a pair of work boots in half that time, so they are good boots. Bought another pair. Not much out there in EEE, glad I found this. Rated 5 out of 5 by majormuscle from great style & looks for a work boot. looks good and comfortable for work.can't tell you have the steel toe, but itsthere just in case.